On Monday May 18th – Victoria Day – visitors to Barkerville Historic Town are invited to enjoy Royal Tea with Royalty, as ‘Queen Victoria’ visits Barkerville’s world-famous Wake Up Jake Restaurant for two sittings of afternoon High Tea – at 1:00 PM and 3:00 PM. In addition to the classic English warm-steeped beverage, delectable treats worthy of the Queen Herself will be on offer, along with the opportunity to interact with Her Majesty, who will delightfully engage with her royal subjects in two official sittings. Patrons will have the opportunity to enjoy one-on-one audiences with Queen Victoria and her gillie ‘Mr. Brown’ as well as British Columbia’s original Chief Justice, Matthew Baillie Begbie. Red Serge-clad members of the local Constabulary are expected to be in attendance to keep the peace and ensure the safety of the Monarch of Great Britain and Ireland, also known as the Empress of India. The Queen, who celebrates Her birthday every third week in May, is reported to be in a remarkable state of fitness and vigour, especially considering Her advanced age of 196 (in 2015). “While We often eschew excessive pomp and ceremony, Our birthday celebration, coming as it does near the outset of each new Barkerville season, is an event that We cherish, especially as it gives Us the opportunity to hear the desires and concerns of the subjects of Our Colony,” She added. There are two official sittings at the Wake Up Jake Restaurant for the Royal Tea, at 1:00 PM and 3:00 PM. Tickets for the event can be purchased at the Visitor’s Reception Centre upon entry into Barkerville Historic Town, for $14.95 per person. 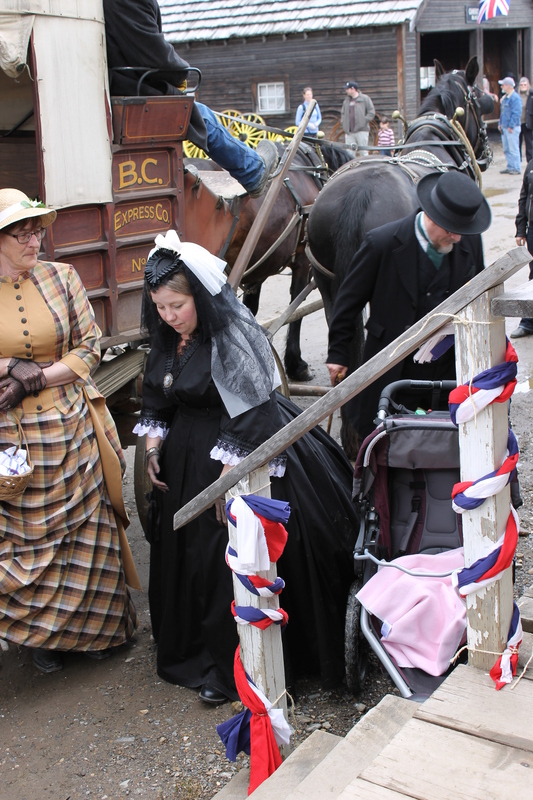 Barkerville opened its Season of Sesquicentennials on May 14th and is celebrating the 150th anniversaries of the Cariboo Amateur Dramatic Association, the Cariboo Sentinel Newspaper, and the completion of the Cariboo Waggon Road all summer long. Visitors to Barkerville in 2015 will also have the opportunity to meet ‘Billy Barker’ himself and, perhaps best of all, admission to the National Historic Site is by donation for the entire month of May. 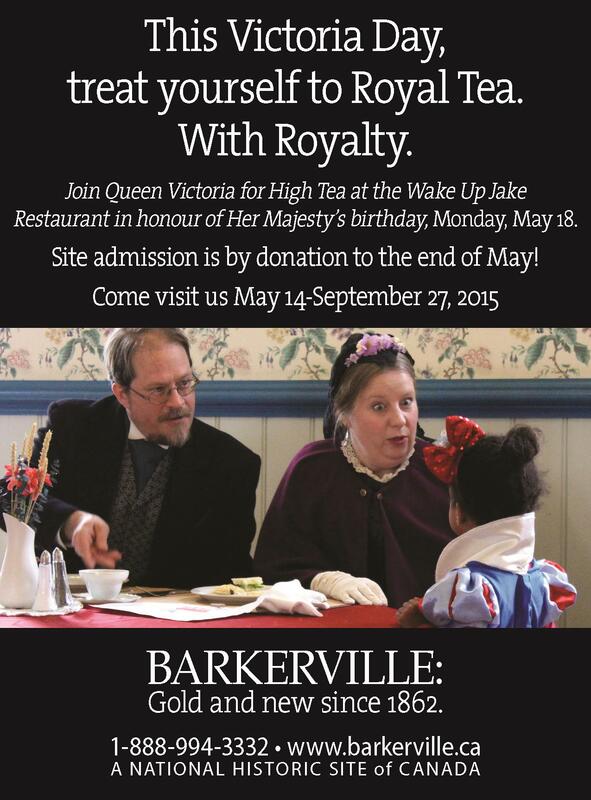 For more information about Barkerville’s annual Victoria Day Royal Tea, or any of Barkerville’s 2015 seasonal special events, please visit www.barkerville.ca or phone 1-888-994-3332, ext. 41.